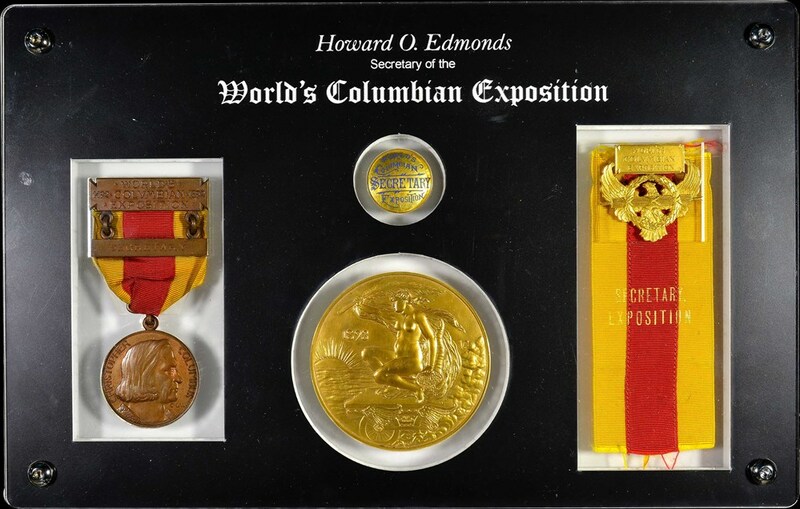 Learn about a small collection of medals formerly owned by Howard O. Edmonds, as well as similar medals awarded to officials at the World’s Columbian Expo. A small collection of medals formerly belonging to an officer of the World’s Columbian Expo, Howard O. Edmonds, was recently certified by NGC. Edmonds held an elite position as a part of the board of officers. 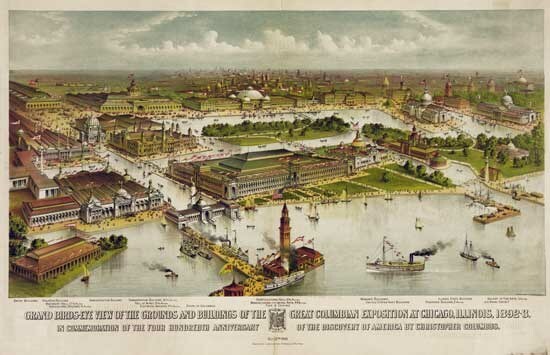 The World’s Columbian Exposition was technically a corporation organized under the laws of Illinois, with its purpose to organize and oversee the fair. The corporation’s stock was worth $10 million, $6 million of which was owned by 30,000 individuals, most of whom lived in Chicago. The corporation was controlled by a board of 45 directors who were chosen annually. In addition to the 45 directors was a board of officers known as the “Executive Department”, which was responsible for carrying out instructions from the Board of Directors. This consisted of four officers, the president, two vice presidents and a secretary. 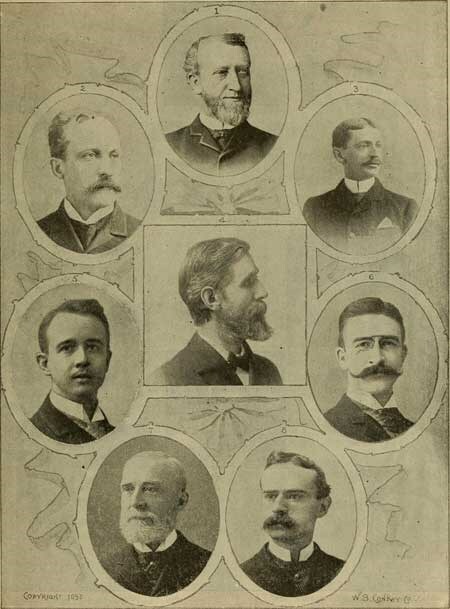 The Officers of the World’s Columbian Exposition, with President Harlow N. Higinbotham at the center. Howard O. Edmonds (secretary) and Ferdinand W. Peck (first vice president). 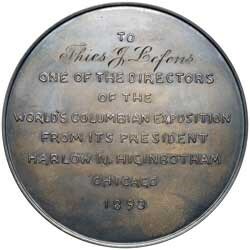 Each of the 45 directors received a special “Directors Medal,” upon which their name was engraved. The medal was struck in silver, is 63 mm in diameter, and is cataloged as Eglit-408. 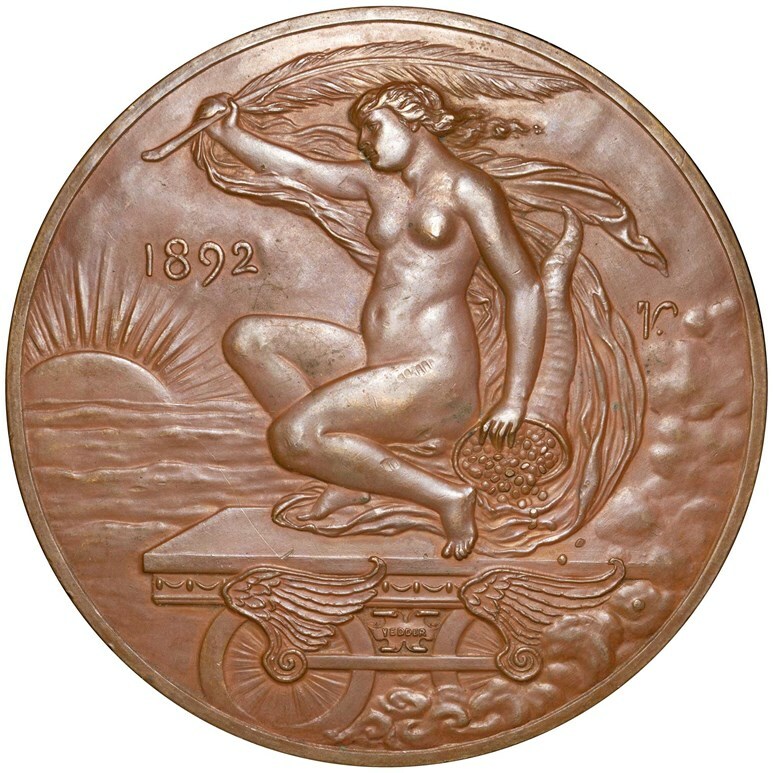 A similar medal, awarded to designers, was issued in bronze. (These were dated 1892, and are cataloged as E-335 or E-336). 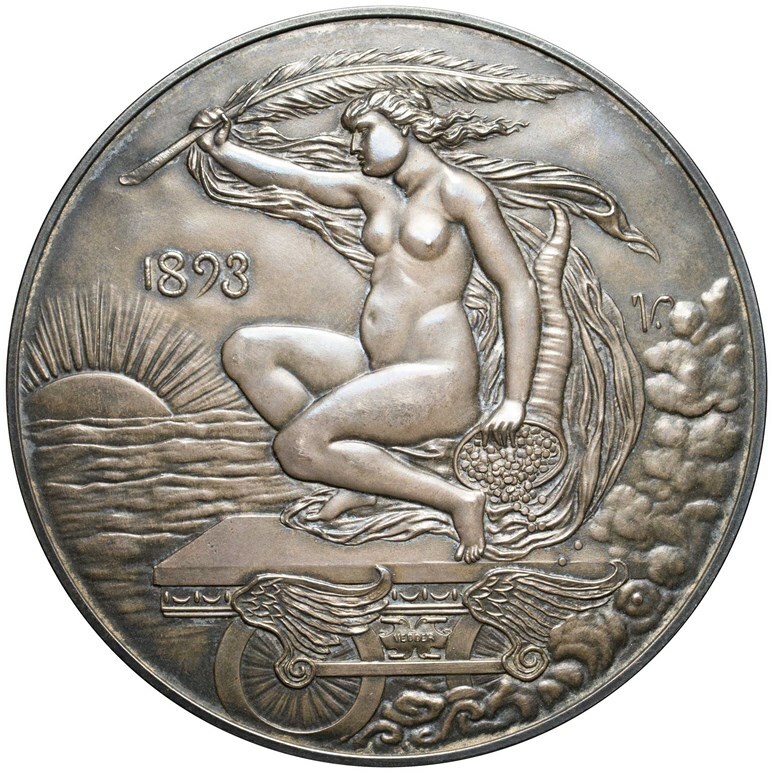 The obverse features Civilization on a winged car, holding a cornucopia and facing toward a setting sun. 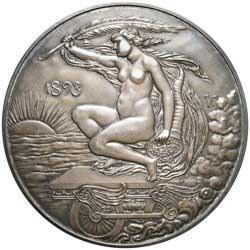 Because of a few deaths and resignations on the board, it is assumed about 50 such silver medals were issued. 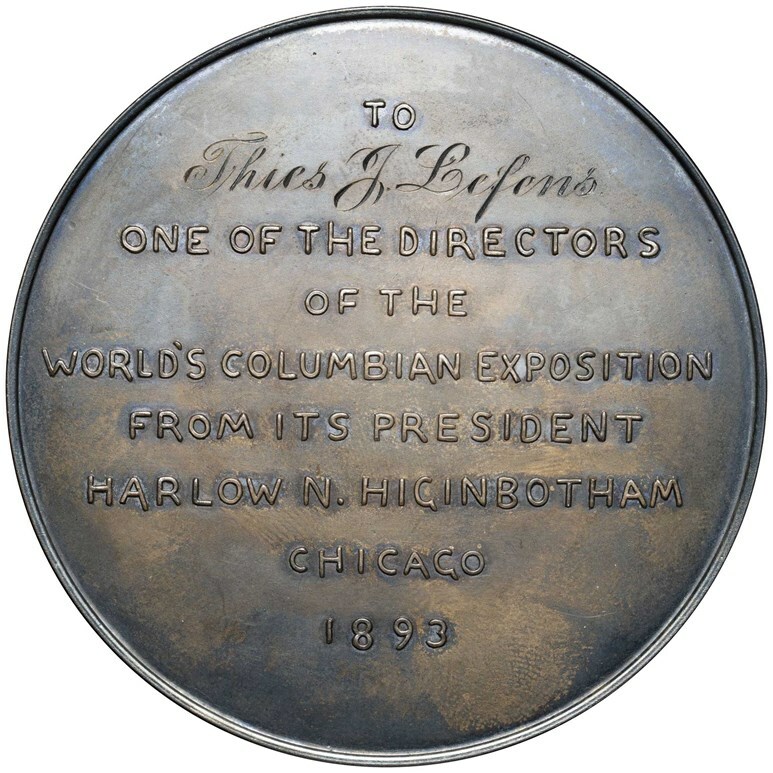 Top, a Directors Medal awarded to Thies J. Lefens. 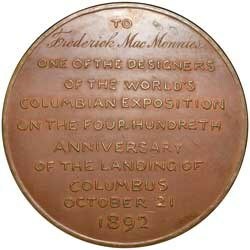 Bottom, a Designers medal awarded to Frederick MacMonnies. Ironically enough, while the latter received just a bronze medal, he has attained more prominence in history by far. 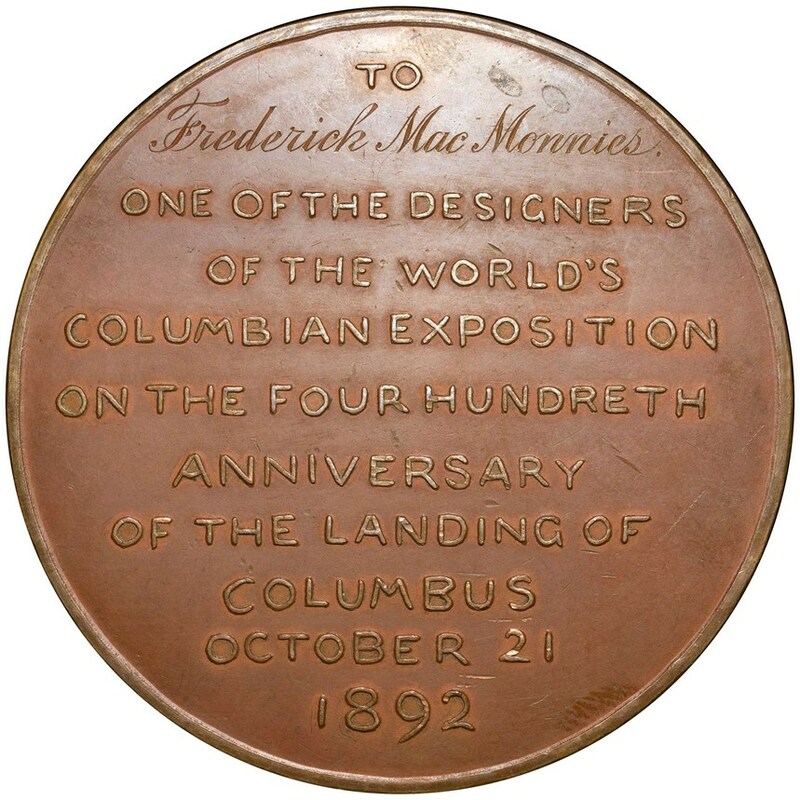 commission to sculpt the Columbian Fountain, the centerpiece of the expo. In addition, the officers were awarded medals, as well. The obverse is the same as Eglit-408, but the reverse was left blank for more personalized inscription. Because of their positions, each presumably received a medal in gold. 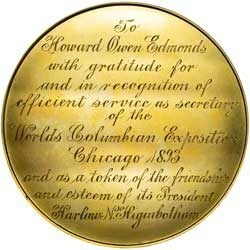 Edmonds' medals read: “To Howard Owen Edmonds with gratitude for and in recognition of efficient service as secretary of the World’s Columbian Exposition Chicago 1893 and as a token of the friendship and esteem of its President Harlow N. Higinbotham.” The medal was acquired in a set of related items from the family descendants of Edmonds by a private collector in 2010, and was subsequently purchased by Alan V. Weinberg at the Tampa FUN show a year later. 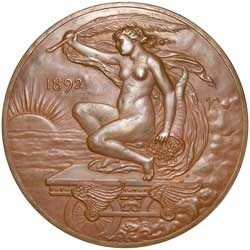 The Officers Medal was struck by Gorham in 22 carat gold, and weighs a whopping 192.73 grams (6.2 troy ounces). Eglit-408A. It graded NGC MS 65. The set also contained a few other items. 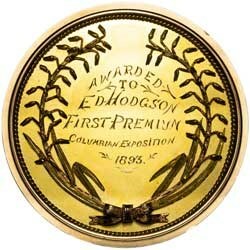 First, a bronze medal attached to a ribbon with a pinback badge. 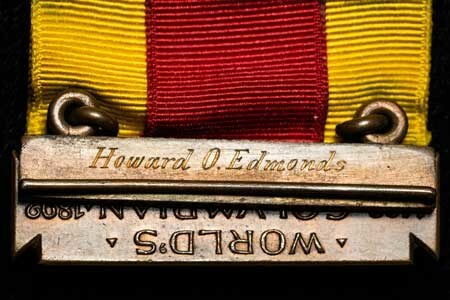 The attachment below the badge is inscribed “secretary” on the front, with Edmond’s name on the back. 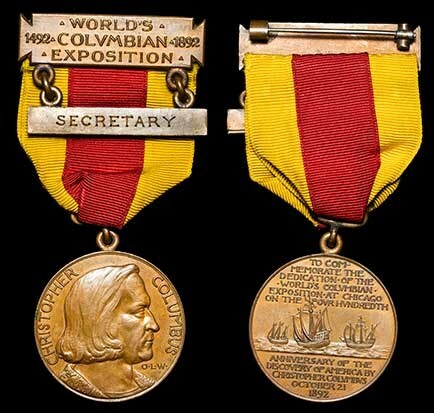 Another ribbon with a gold eagle badge at the top and stamped “Spaulding & Co” was included, as well as a 23 mm gold, blue enameled concave pin, inscribed “H.O. Edmonds”. These items are all housed in a custom plastic display case. NGC issued photo certificates for the medallic items so the set will remain intact. Howard O. Edmonds' complete set inside its custom case. 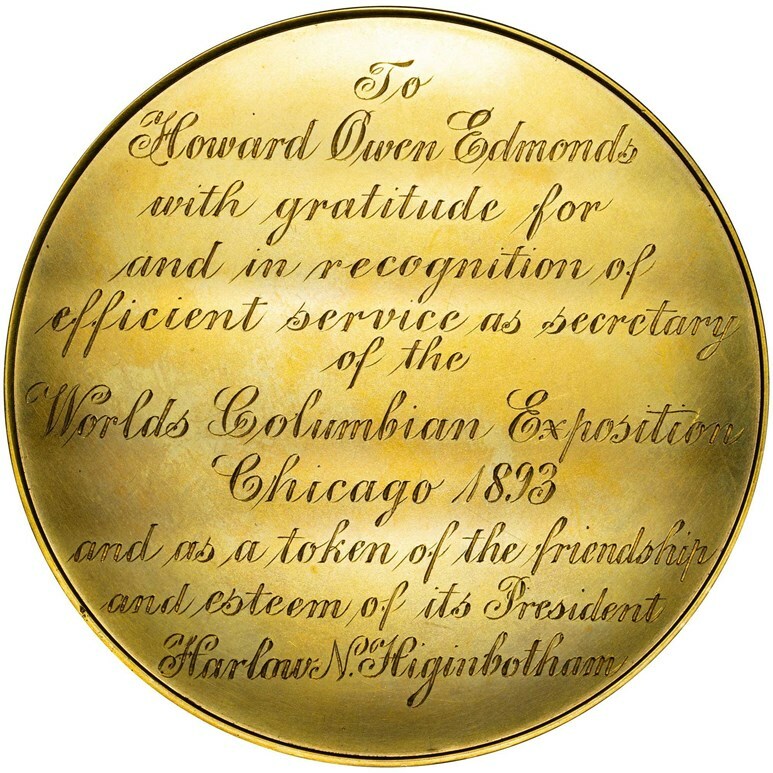 Edmonds was responsible for keeping the records for the board and its committees, as well as issuing stock certificates and bonds for the corporation. He also possessed the authority of the corporate seal. At just 28, he was the youngest of the officers on the Executive Board. Born in Pennsylvania, he worked for four years at the Evening-Star in Washington, D.C. (a daily afternoon newspaper), and later became private secretary to Assistant Postmaster General Smith A. Whitfield during the first part of President Benjamin Harrison’s administration. He resigned this position to accept a similar one under Hon. Benjamin Butterworth, who had become secretary of the World’s Columbian Exposition in April 1892. When Butterworth declined to serve another term as secretary, Edmonds was elected to succeed him. 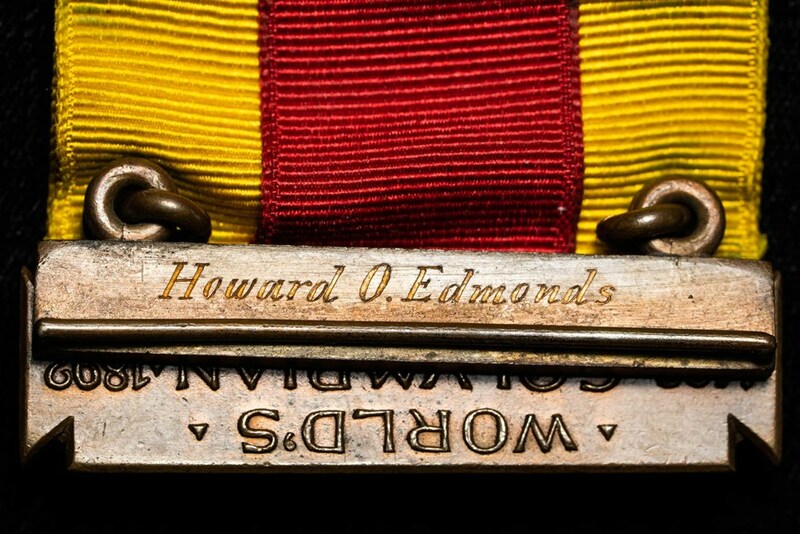 Edmonds' pinback badge with a ribbon and medal attached (Eglit-406). The Medal graded NGC MS 64. 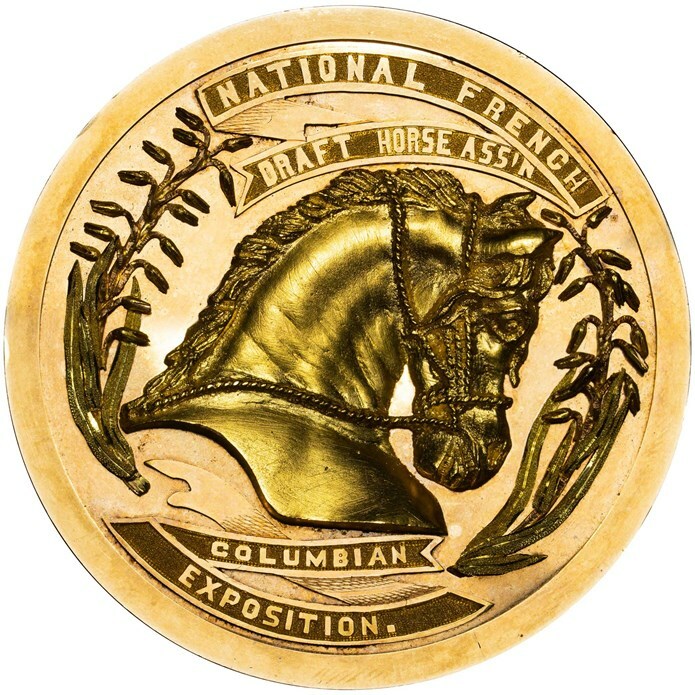 Also submitted with Edmonds' set was a unique award medal issued by the National Draft Horse Association. 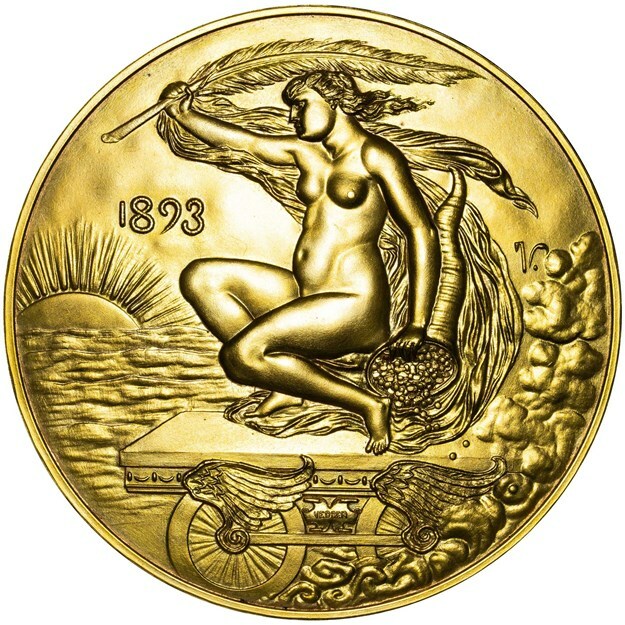 The medal is constructed from a blank gold planchet, upon which a gold rim was mounted. The obverse consists of high-relief fixtures, including the horse head, and the legend upon ribbons—apparently crafted by a skilled jeweler. The owner retains the original plush-lined leather box the medal was issued in. There is no maker’s identification mark on either the medal or its box. 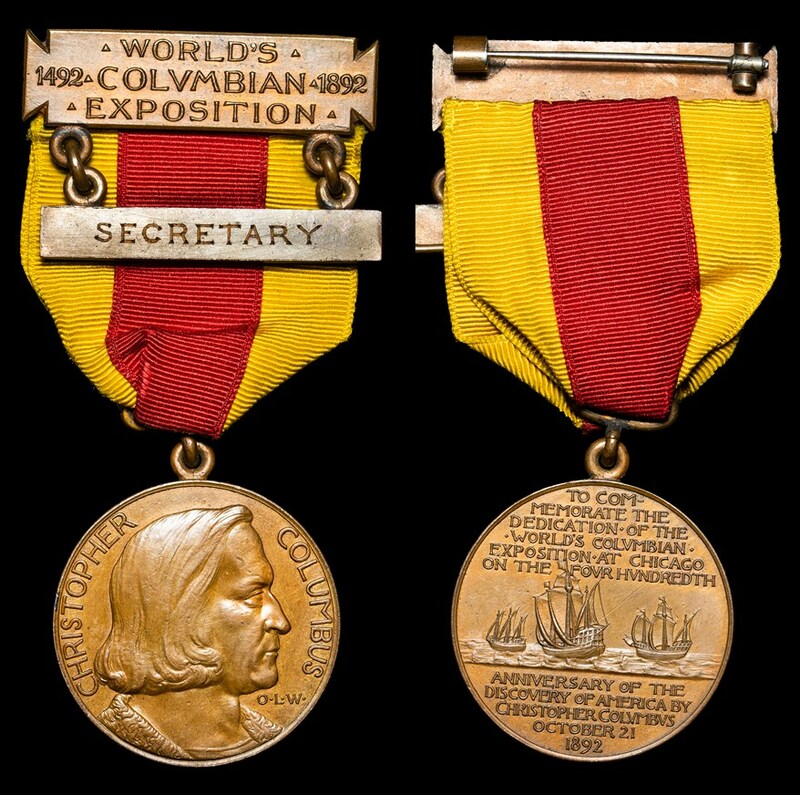 This medal was acquired from Anthony Terranova’s personal collection in 2013. 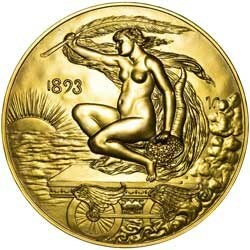 The custom gold medal awarded to Ed. Hodgson. This medal is unlisted in Eglit. It graded NGC MS 66. From May 1 to October 30, more than 27 million visitors from around the world came to see the latest technological conquests of the time and experience attractions like the 264-foot-high ferris wheel, which could carry up to 2,000 passengers. It is impossible to describe the fair in one paragraph, so allow the rich historic records to be your guide, and you will not be disappointed. But let it be known that it was officers like Edmonds, artists like MacMonnies, and even forgotten men like Director Lefens who united to create one of the most magnificent events in history. An aerial illustration of the fairgrounds and buildings at the exposition.